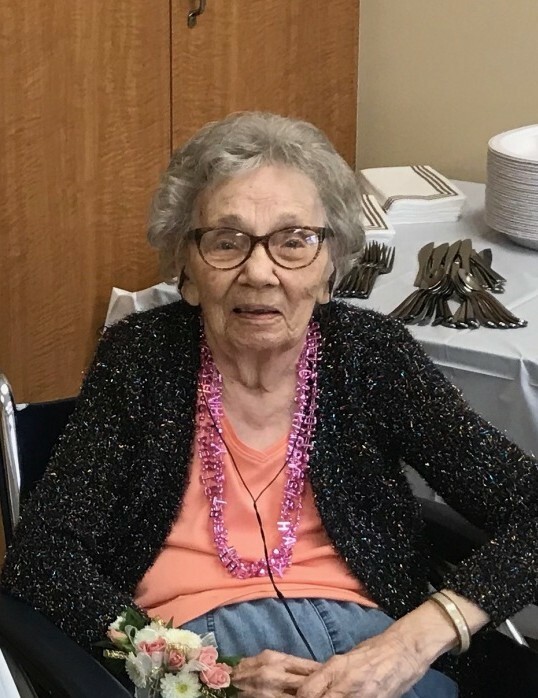 Evelyn I. Cornue, 100, a lifelong resident of Linn Township, WI died Sunday March 17, 2019 at Lakeland Health Care Center in Elkhorn, WI. The former Evelyn Irene Wissell was born February 4, 1919 in Lake Geneva, WI the daughter of the late William and Agnes (Matthews) Wissell. On June 12, 1939 in Zenda, WI she was united in marriage to James H. Cornue; he preceded her in death on September 12, 1994. She had been a lifelong member of the Linn Presbyterian Church. Evelyn is survived by: 2 children; Judy (Elof) Borgeson of Genoa City, WI, and Pamela (Richard) Bebber of Peoria, IL, 5 grandchildren; Kirk and Matthew Gordon, James Durkee, Jacqui (Jim)Thompson and Rene (Robert) Kenney, 6 great-grandchildren; James Durkee, Catherine Gordon, Jordan, Luke, Landon and Sami Logdson and 1 great-great-grandson, 2 brothers; Robert (Louise) Wissell and Richard (Joan) Wissell. She was preceded in death by: a son William Cornue, a daughter Brenda Gordon, an infant son, a sister Margaret Heike and 3 brothers; James Wissell, Charles Wissell, and William Wissell. Services for Evelyn will be held on Saturday March 30, 2019 at 11:30 a.m. at Linn Presbyterian Church, Lake Geneva, WI. Visitation will be Saturday from 10:30 a.m. until time of service. In lieu of other expressions of sympathy memorials are requested in Evelyn’s name to: Linn Presbyterian Church.